organic materials with different morphologies deposited by simple vacuum thermal evaporation technique. ensuring its application in flexible and top emitting OLEDs. oxygen, which causes rapid degradation. injection and collection of charge carriers less efficient. is important for extended lifetime of organic devices. tronics remains a challenging endeavour. pared to the devices with no encapsulation layers. using an ultrasonic bath and then dried in vacuum oven. madzu 2401 PC) in the range of 200 - 800 nm. Ir (ppy)3 (35 nm)/TPBi (30 nm) /LiF (1 nm)/Al (200 nm). spectively. The size of each pixel was 5 mm  5 mm. 2400 programmable current-voltage digital source meter. deposition (b) after 20 days (c) after 40 days of storage. storage at room temperature (45% RH). or oxygen molecules as explained in Section 1.
measuring ultra-low permeation rate of barrier films. for detecting the presence of oxygen and water vapour. 0.04 for the structures 2(a), 2(b) and 2(c) respectively). 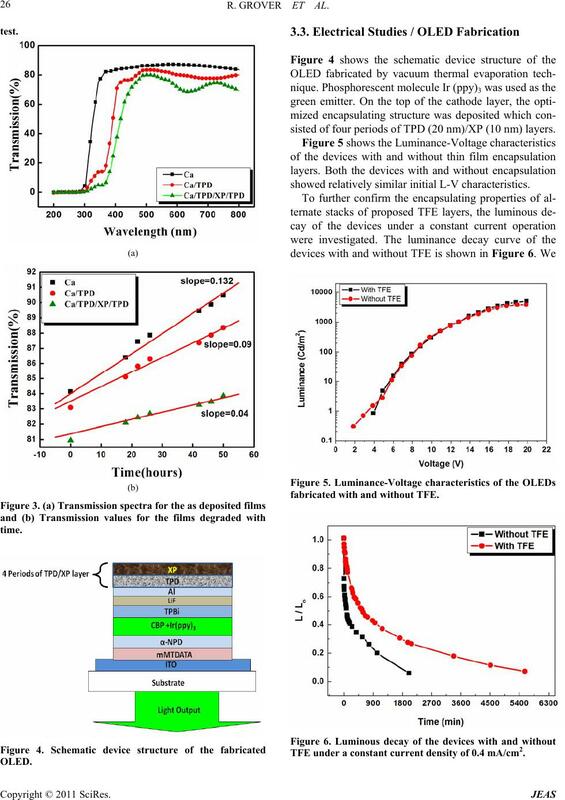 sisted of four periods of TPD (20 nm)/XP (10 nm) layers. showed relatively similar initial L-V characteristics. fabricated with and without TFE. TFE under a constant current density of 0.4 mA/cm2. well as top emitting OLEDs. 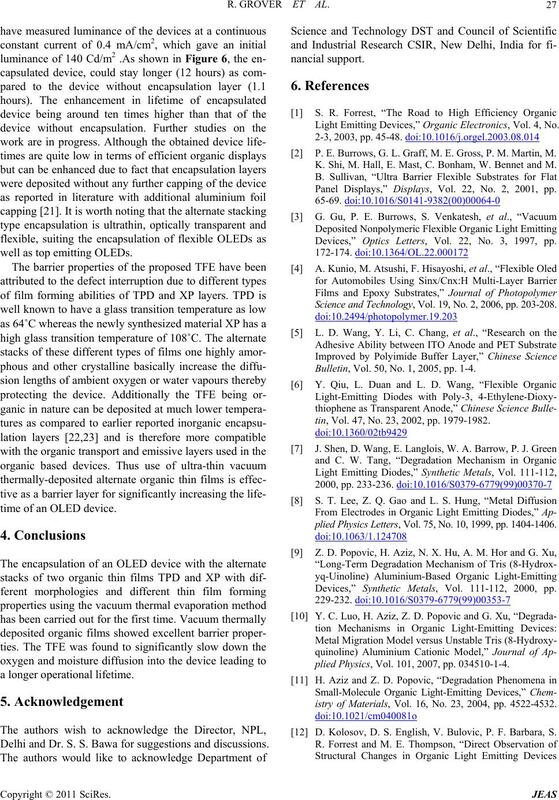 time of an OLED device. Delhi and Dr. S. S. Bawa for suggestions and discussions. 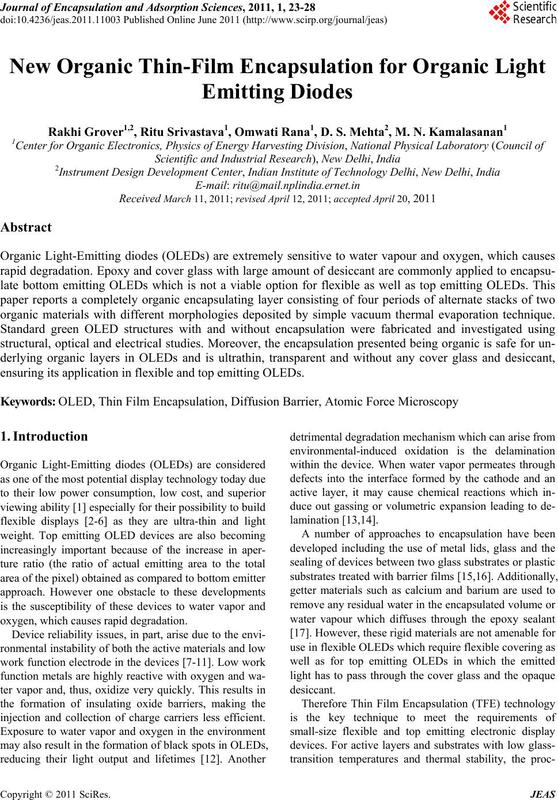 Light Emitting Devices,” Organic Electronics, Vol. 4, No. P. E. Burrows, G. L. Graff, M. E. Gross, P. M. Martin, M.
K. Shi, M. Hall, E. Mast, C. Bonham, W. Bennet and M.
Panel Displays,” Displays, Vol. 22, No. 2, 2001, pp. Devices,” Optics Letters, Vol. 22, No. 3, 1997, pp. Science and Technology, Vol. 19, No. 2, 2006, pp. 203-208. Bulletin, Vol. 50, No. 1, 2005, pp. 1-4.
tin, Vol. 47, No. 23, 2002, pp. 1979-1982.
plied Physics Letters, Vol. 75, No. 10, 1999, pp. 1404-1406. Devices,” Synthetic Metals, Vol. 111-112, 2000, pp. plied Physics, Vol. 101, 2007, pp. 034510-1-4.
istry of Materials, Vol. 16, No. 23, 2004, pp. 4522-4532. 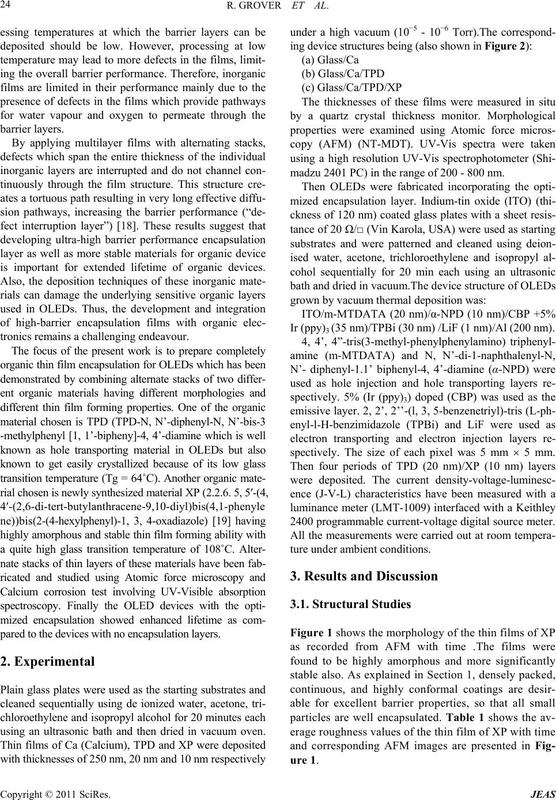 D. Kolosov, D. S. English, V. Bulovic, P. F. Barbara, S.
During Degradation,” Journal of Applied Physics, Vol. 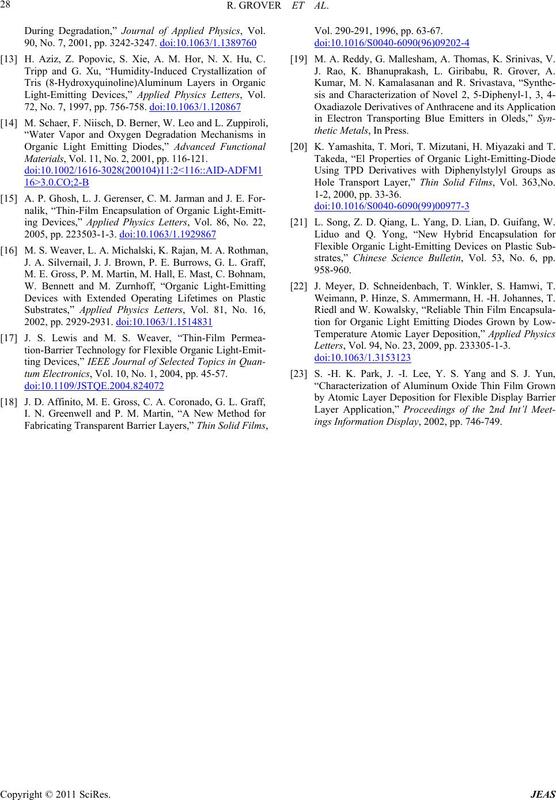 H. Aziz, Z. Popovic, S. Xie, A. M. Hor, N. X. Hu, C.
Light-Emitting Devices,” Applied Physics Letters, Vol. Materials, Vol. 11, No. 2, 2001, pp. 116-121.
tum Electronics, Vol. 10, No. 1, 2004, pp. 45-57. Vol. 290-291, 1996, pp. 63-67. M. A. Reddy, G. Mallesham, A. Thomas, K. Srinivas, V.
J. Rao, K. Bhanuprakash, L. Giribabu, R. Grover, A.
 K. Yamashita, T. Mori, T. Mizutani, H. Miyazaki and T.
Hole Transport Layer,” Thin Solid Films, Vol. 363,No. 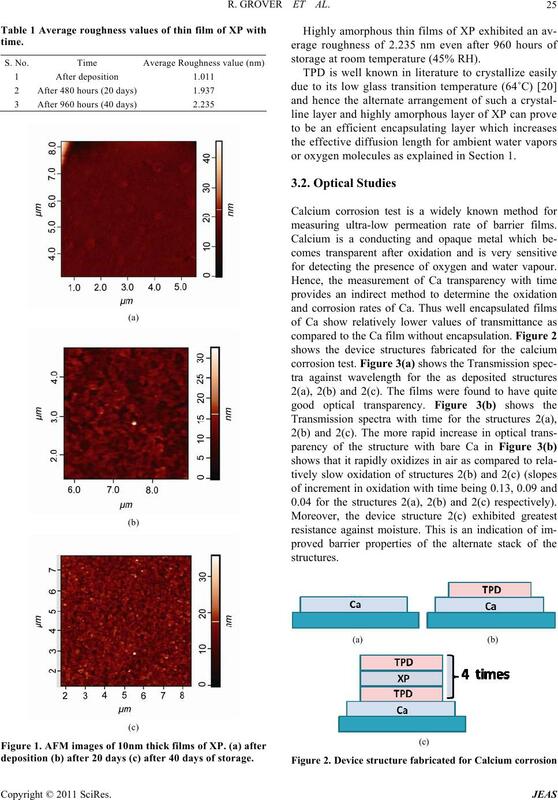 L. Song, Z. D. Qiang, L. Yang, D. Lian, D. Guifang, W.
strates,” Chinese Science Bulletin, Vol. 53, No. 6, pp. J. Meyer, D. Schneidenbach, T. Winkler, S. Hamwi, T.
Weimann, P. Hinze, S. Ammermann, H. -H. Johannes, T.
Letters, Vol. 94, No. 23, 2009, pp. 233305-1-3.
ings Information Display, 2002, pp. 746-749.